Periodically, I will be posting blog content by the artists I represent. Here is the first by Rose Kelly. One fine fall day, seven members of the Book Club, a group of Bay Area artists who meet weekly in Oakland, boarded the ferry to Alcatraz. The Book Club meets to discuss art, give feedback and support, plan exhibits and occasionally takes field trips. The group was not interested in visiting the former prison per se but in the work of Chinese dissident artist and activist Ai Weiwei. An unprecedented collaboration between the For-Site Foundation, the National Park Service and the Golden Gate National Parks Conservancy resulted in @Large: Ai Weiwei on Alcatraz being installed on the former prison site, which is now a national park. While no government money was used to fund the project, it is a credit to the NPS that, considering the political content of Ai Weiwei’s art, they agreed to host the project. Cheryl Haines, director of the For-Site Foundation raised both the idea for the project and the $3.5 million needed to fund it. The adjoining rooms used the crumbling walls, peeling paint and broken windows of the abandoned building to full effect. 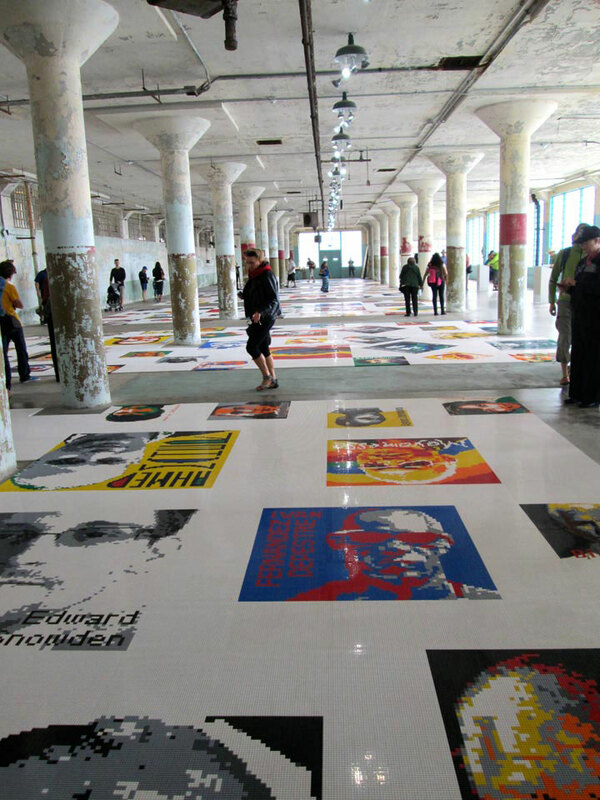 In the next room, portraits made from Legos© covered the floor like carpets. Entitled TRACES, 1.2 million Lego© pieces were used to create 176 portraits of prisoners of conscience and political exiles. The installation reminded this author of the Aids Quilt, putting a human face to what is so often only a nameless statistic. Their impact lays in the realization that only a small percentage of the people worldwide who have been detained for their beliefs are represented. Aisles separated the groupings, and at the end of each one an informational binder detailed the individuals pictured and their circumstances. Ai Weiwei, who did not include his portrait, had his passport revoked by the Chinese government and is unable to leave the country. He sent digital blueprints to the For-Site Foundation as well as a number of assistants from his studio to guide the installation. For-Site staff members with the help of 100 volunteers assemble the portraits. Some portraits were of familiar faces like Edward Snowden and Nelson Mandela. Others showed unknown or forgotten figures like Gedhun Choekyi Nyima, the 11th Panchen Lama, a child who disappeared with his family when the Chinese government declared their own Panchen Lama.